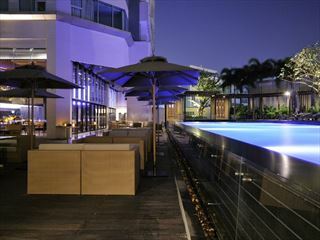 Contemporary, stylish and classy – Akyra Thonglor Bangkok truly encapsulates Bangkok’s cool urban style. 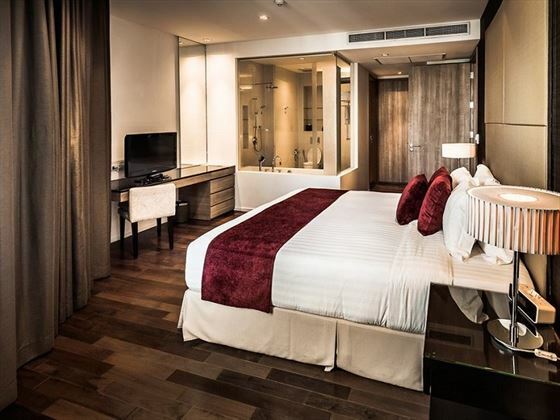 Nestled within the hip neighbourhood of Thonglor, this boutique hotel is ideal for trendy travellers. Ranging from smaller Studio suites to expansive Three-Bedroom Suites, the self-catered accommodation here is lavish and luxurious. Floor-to-ceiling windows look out onto phenomenal views of the city skyline, with modern interiors and lush amenities adding a fashionable touch. 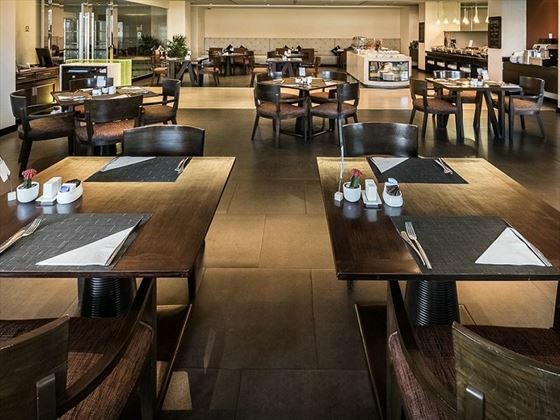 Cook yourself a delicious meal in your kitchen or kitchenette, head out into the neighbourhood to try out a few of the hip eateries and bars, or choose from a variety of menus from the hotel’s partner restaurants and get your delicious dish sent directly to your suite. 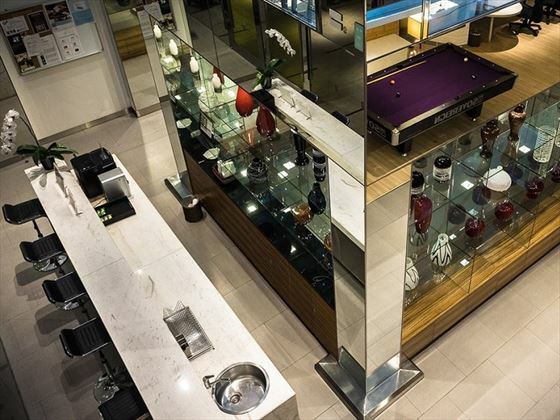 Either way, you’ll be taken on a tantalising foodie journey. 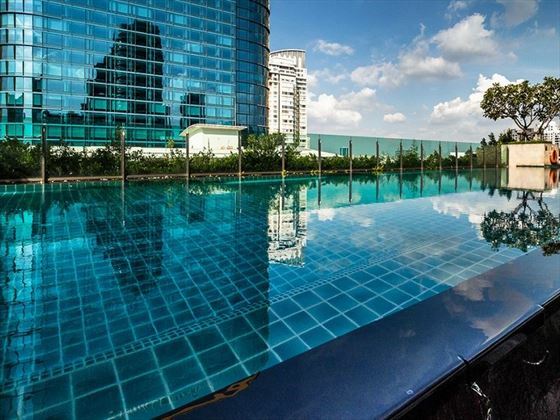 The hotel does have a small bar and lounge area with a pool table, but the main draw is the stunning infinity pool that offers dramatic views of Bangkok’s skyline. 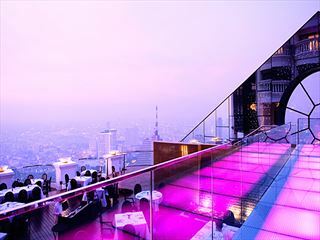 This ultra-cool hotel is located in Thanglor, one of Bangkok’s trendiest neighbourhoods. 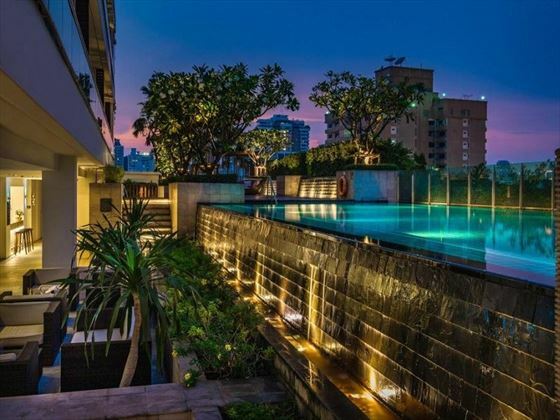 Nestled between Sukhumvit Soi 55 and Petchburi Road, you’ll only be a short stroll away from the area’s most dynamic restaurants, bars and shops. 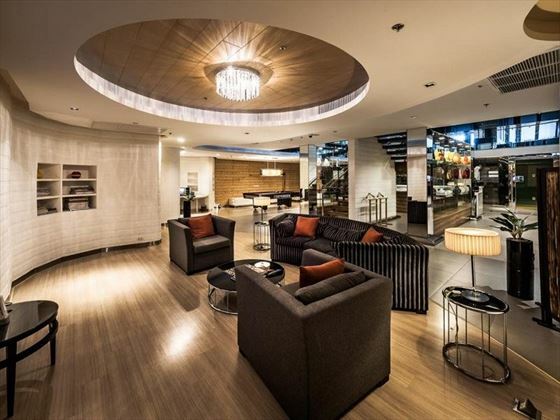 You’re also within walking distance of the Skytrain station, giving you the chance to explore even further. 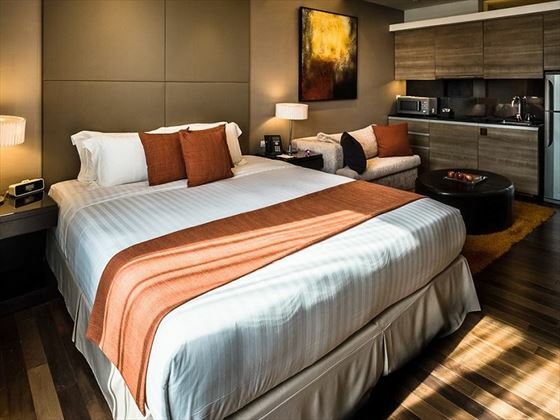 Studio – Contemporary 37sqm studio suites, featuring a large king size bed, a small seating area, a kitchenette and floor-to-ceiling windows looking out onto Bangkok’s city skyline. 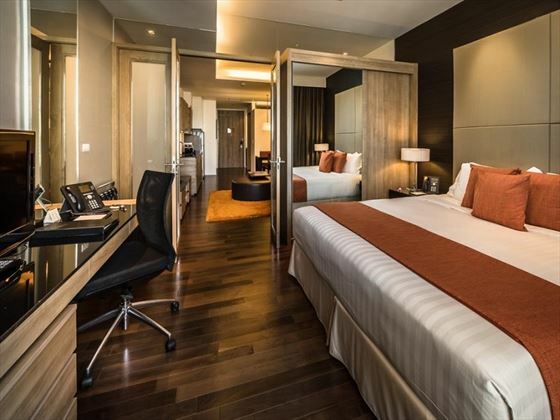 One Bedroom Suite – Spacious and trendy 61sqm suites, featuring a bedroom with a king size bed, an expansive living and dining area, a well-equipped kitchenette, two TVs, and gorgeous views of the city from the floor-to-ceiling windows. 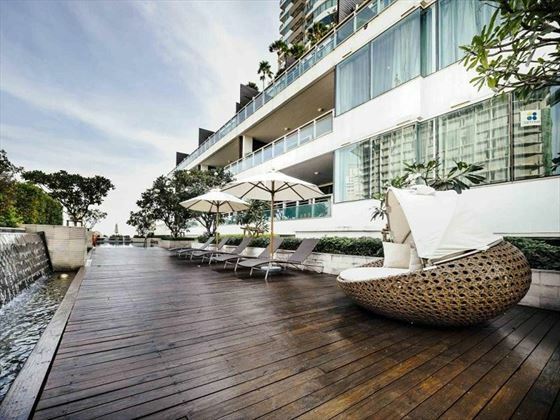 Two Bedroom Suite – Luxurious 118sqm suites with two ensuite bedrooms, a separate living and dining area looking out onto Bangkok, a full kitchen, and plenty of beautiful natural light. 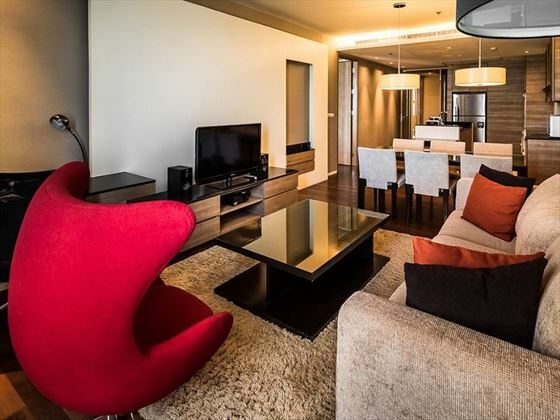 Three Bedroom Suite – Stunning, ultra-modern 154sqm suites featuring three lavish bedrooms, a large living and dining space for up to seven guests, a fully-equipped kitchen, a surround-sound home theatre system, and phenomenal city views from the private balcony. 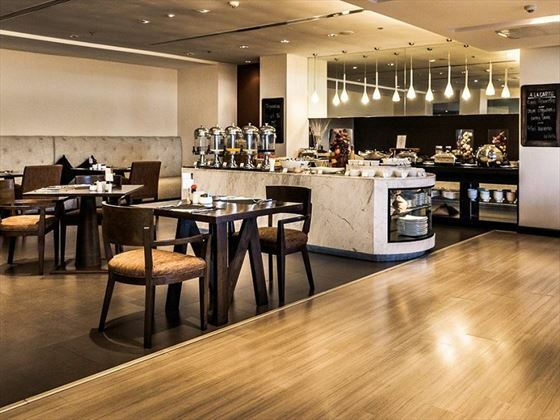 Daily Breakfast Restaurant – Get your day to a great start with a sumptuous breakfast fusing Western and Asian favourites. The buffet has a huge variety of choices. Open 5.45am-10.30am. Dress code: Casual. In-Room Dining – Select from the menus of the hotel’s partner restaurants and your delicious dish will be delivered directly to you. Open 10am-11pm. 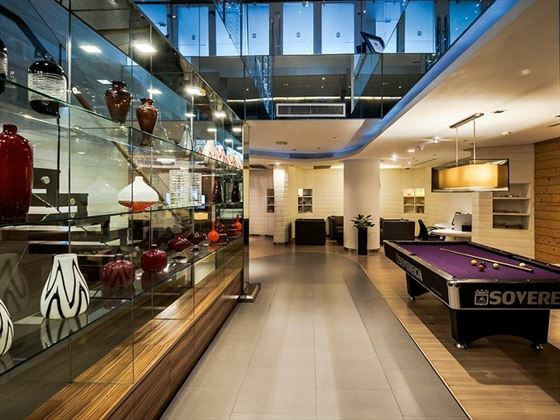 Bar and Lounge – The hotel has a lounge area with a small bar and a pool table. 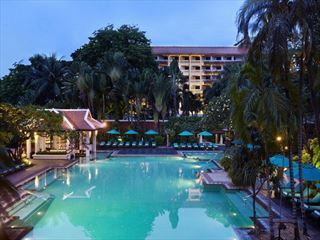 The hotel has no restaurant for lunch or dinner, but you’re only a short stroll away from some of Bangkok’s most decadent restaurants, mostly found on Sukhumvit Soi 55 and Petchburi Road.